Charities are spending increasing amounts on TV adverts over the festive period. Stuart Derrick reports. 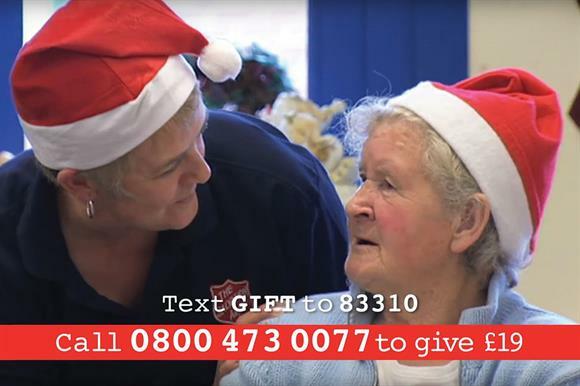 Turn on a commercial TV channel over the Christmas period and it's likely you'll see a charity advert within minutes. In fact, research by the digital media agency equimedia found that 60 charities ran TV campaigns last December across 413 digital and satellite channels. Tiffany Stubbs, group account director at equimedia, says Christmas is a key time of year for charities, although the peak fundraising period starts earlier. "Recent data from the Charities Aid Foundation shows that donations peaked in November last year, boosted by Children in Need, the Poppy Appeal, Giving Tuesday and Movember campaigns," she says. "December also typically sees higher than average donations - and, as we found last year, a very high frequency of TV appeals as a result." Figures from the research company Nielsen confirm that charities are spending more on TV advertising. Total charity advertising spend was up by 6 per cent to £458.8m in 2015/16, with TV accounting for more than a quarter of it at £120.5m, up 15 per cent on the previous year. Debbie Bremner, an advertiser business partner at Nielsen, says: "The final quarter of the year is really a golden one in terms of charity advertising, with the sector spending about 37 per cent more on advertising than it would during a normal quarter. Although Macmillan Cancer Support and Cancer Research UK are the largest spenders throughout the year, the Salvation Army, not even a top-five spender normally, spends the most during the final quarter." Alex Wood, head of individual giving at the Salvation Army, says its fundraising is about three times more effective - and cost-effective - in November and December, and accounts for about 30 per cent of its yearly income from appeals. TV forms an integral part of the appeals campaign, along with cold mail, door drops, inserts, press advertising and digital adverting. "TV has been a part of our Christmas fundraising appeal since the early 1990s and delivers massively valuable visibility and new donors," says Wood. "Someone might see our advert on television, then a week later receive a door drop and be more inclined to give." Research by the payment technology company First Capital Cashflow found that 38 per cent of respondents said they were more likely to donate to a good cause in the run-up to Christmas. But the fact that Christmas carries so much potential is also a challenge for charities, says Kate Cranston-Turner, senior researcher at the consultancy nfpSynergy. "The problem is that they are communicating at a time of year when there is a lot of 'noise' from other messages, so they have to work harder to be heard," she says. "But they can't afford to not be communicating." NfpSynergy research on recall of charities' Christmas advertising last year found that 86 per cent of those polled did not remember any. But there was recognition that charities had a role to play at Christmas, and 60 per cent of people said they heard more from them at this time of year. Finding a way to achieve cut-through in a crowded environment is essential, says Richard Hill, chief strategy officer at the agency Atomic London. Last year it developed a campaign for WaterAid that dispensed with traditional approaches to fundraising. "Charity DRTV has become too formulaic," Hill says. "If you don't do something different, people just glaze over. For an overseas charity, we had to find a reference point people could appreciate." Atomic used the 1990s pop song Sunshine on a Rainy Day, sung by an African schoolgirl. The advert started on a rainy day in the UK, moving to a Zambian village where water was something to be celebrated. Such TV adverts are increasingly used to build recognition and create an emotional connection to the rest of the campaign, says Hill. No one was prepared to comment on the average return on investment of charity TV adverts, but data from Thinkbox, the marketing body for TV, suggests they do pay their way. Its figures show that TV adverts drive 20 per cent of short to medium-term response for charities, compared with 13 per cent for other sectors. Equimedia's Stubbs says charities need to think about using video content online. "YouTube can be a cost-effective option for charities, with cost-per-views available for less than 30p and shoppable videos on offer too," she says. Cancer Research UK used real-life stories of cancer patients and their families in the TV advert for its Right Now campaign. Jo Cooke, the director of brand, marketing and innovation at CRUK, says that TV remains an important channel for the charity. "It is a good environment to get people's attention and deliver impact, and helps us to reach a broad audience," Cooke says. DO RETAILERS' CHARITY ADS WORK? Christmas is incomplete without the launch of retailers' festive blockbuster adverts, and charities are increasingly using them as springboards for their own fundraising and awareness efforts. Last year, Sainsbury's partnered with the Great Ormond Street Hospital Children's Charity for a TV campaign, The Greatest Gift, highlighting the importance of sharing Christmas with friends and family. Funds were raised from the sales of gingerbread characters and animation kits in-store, and customers were asked to add 20p donations to their bills. Sainsbury's approached GOSHCC after hearing a presentation about its work. The campaign raised £550,000, which is being used to fund dedicated parent and carer accommodation close to the hospital. Other retailers with Christmas charity advert links include Aldi, which sold soft toys to benefit Barnardo's, Waitrose, which linked up with Crisis, and John Lewis (last year's Christmas advert), which partnered with the Wildlife Trusts to sell soft toys, with 10 per cent of each sale going to the charity. It's not just about funds, though. Age UK reported a boost in inquiries about volunteering after its 2015 partnership with John Lewis. Typically, the approach comes from a retailer that is looking for a different charity each year. A note of caution comes from Kate Cranston-Turner, senior researcher at the consultancy nfpSynergy. Its research found these campaigns were not well remembered by the public, and they tended to remember the retailer above the charity. "It suggests that the message is not getting through," she says.